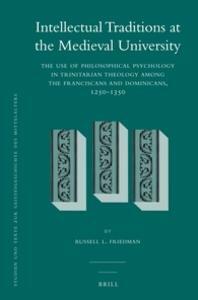 This book traces the rise and decline of two rival intellectual traditions in later-medieval trinitarian theology, one of them predominantly Franciscan, the other predominantly Dominican. Disagreeing about the way to understand the identification in John's Gospel of the second person of the Trinity, the Son, with the Word, the two traditions clashed over the issues of concepts and concept formation, the category of relation, counterfactual logic, and the use of authority. Considering more than seventy theologians from the period, the book presents an overview of the debate, while also including detailed studies of the trinitarian views of such thinkers as Thomas Aquinas, Henry of Ghent, John Duns Scotus, Peter Auriol, William Ockham, Walter Chatton, and Gregory of Rimini.